I've wanted to get a photo of this sign for a while now, and I finally made the trip today to get it. 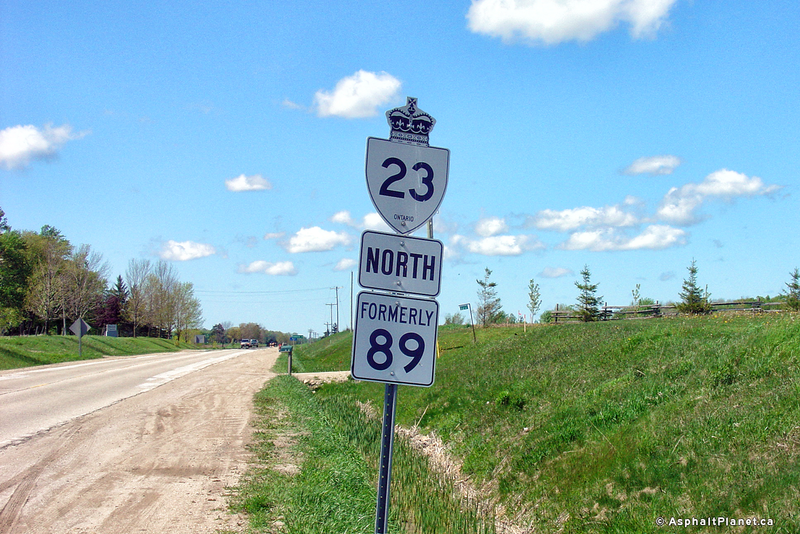 The sign is located at Halton RR 25 and 32 Side Road just north of Acton, ON. Of course, this used to be King's Highway 25, hence the sign below saying "Formerly Hwy 25". I'm just curious if anyone has seen any other examples of signs like these? I'd like to exclude signs like this one on the 400 NB, since I believe these style of signs are more standard. I wasn't expecting to see any examples on street blades; cool find! I know for a fact that the new Peel Region 107 sigange has a tab underneath that reads (Formerly Hwy #7), same goes for Hwy 50. In Peel Region, although Highways 2, 5, and 10 passed through the region. they were never retained as regional roads oddly enough, therefore Dundas Street is just Dundas Street, nothing special. Same goes for Hurontario Street in Mississauga and Brampton. The latter especially to someone who lives in either Brampton or Mississauga is amusing as Highway 10 is still commonly used to refer to Hurontario Street. The reason 2, 5, and 10 were not made regional roads was is because they were city-maintained connecting links prior to downloading. Which I think makes sense: Cities don't need rural type county road systems. And the amusing thing to me is that people still call Hurontario St. Hwy. 10 considering how long and urbanized it is.